Ideal for safely removing bulbs from your border after flowering. 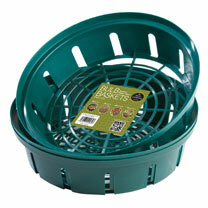 Add soil to the base of the basket, mix in a high potash feed such as Comfrey Pellets then place the bulbs. Dig the whole basket into flowering position and cover with more soil. After flowering, lift the basket and allow the foliage to die back. Bulbs can be removed and dried or left in the basket. Round baskets: 26cm diameter. Pack of 3.